So I’m already 3 weeks into my half marathon training…just 9 weeks left until the big day! It is hard to believe that in just over 2 months I will be running the longest distance I have ever run – 13.1 miles. Up until now, the longest I’ve gone is 10k or about 6 miles, so I will be doubling that distance plus a bit. Yikes!! I managed to get in all of my planned runs in weeks 2 and 3. Week 2 had me running 2 miles, 3 miles, 3 miles and 5 miles. Week 3 had me running 2 miles, 3 miles, 3 miles and 6 miles. I did the 6 miler today. It was a fairly mild but windy day in Toronto today, and somehow I had the bright idea of running the 6 miles on my parents’ treadmill. This turned out to be a very bad idea. 2 miles in I was bored out of my mind and also too hot! I’ve really gotten used to the cold running temps and running in room temperature with no breeze did not feel nice at all. So after 2 miles I bundled up and headed outside to finish up the final 4 miles. Much much much better! Part of the reason I love running so much is that it gives me a chance to get outside in the winter, when I normally would be inside. Week 4 will be a step back week where my long run is only 4 miles. This will give my body a chance to rest up a bit before the next week, where I will be attempting 7 miles – my longest distance to date. I really enjoy the challenge of the long runs. I know that I need to work on my speed because I am SO SLOW (12 minute miles??!!) but for now I don’t want to get injured, so slow it is! Related to injuries, I’m never quite sure when my running shoes are worn out. I find they tend to last me around 4-6 months and towards the last few weeks of their life, I start to get weird aches and pains. For the last 2 weeks I’ve been feeling a twinge of a pain in my left ankle after a run and I wasn’t sure if it was because I have been running a lot, or because my shoes are worn out. I’ve been wearing my current pair since September, so I decided to treat myself to some new shoes this week. 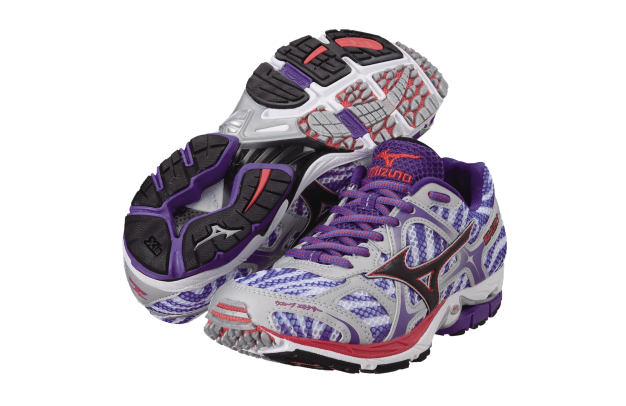 I stopped by my local Running Room and purchased a pair of Mizuno Wave Elixir 7s. Tried them out today on my 6 mile run and they were amazing!!! They are really light weight but still provide support for over pronators, such as myself. It also doesn’t hurt that they are purple with a fun tiger print pattern that is a bit 80s but kinda cool! My ankle is feeling good, so it appears that my new shoes were actually a need, rather than just a want. Have you purchased any fun new running gear lately? Categories: Exercise, Half marathon, Running | Tags: Exercise, Half Marathon, Running, Shoes | Permalink.